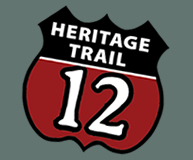 Year-round festivals and fun community events celebrate the history, culture and beauty of the US 12 Heritage Trail. Search the Calendar of Events by month, or date range see why the US 12 Heritage Trail offers something for everyone - from great family days out with the children to events of interest for the real history buff. To email an event to get posted on the website please click here!